Combine old and new practices in the livestock business to create a responsible, profitable, environmentally friendly and sustainable business while trying to preserve the family farm and ranching way of life. Produce quality grass-based beef, grown in the most natural way possible, free of hormones and antibiotics. This involves our animals, of which are born and raised on our ranch, spending the duration of their lives grazing native grasses and browse in the stress free and natural environment of the Milky Ranch. Provide a viable alternative to the current centralized & industrialized food system. We do this by offering an honest, community-based, local food source , a face behind the product, answer questions about how our animals our raised, helping consumers become more connected with their food source. This establishes accountability and source verification that is completely lacking in the current food system. A return to our great grandparent’s method of direct marketing, from neighbors to neighbors. 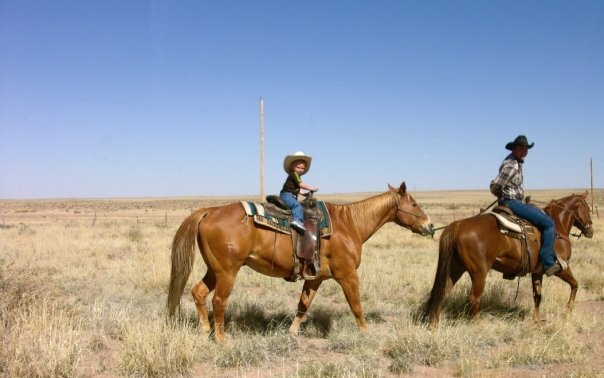 Traegen and Marilyn Knight are fifth generation ranchers with experience on family ranches in the White Mountains of Arizona, and western New Mexico. Both are graduates from Arizona State University, with degrees in Agribusiness and Conservation Biology. Marilyn’s grandparents farmed in Buckeye and had a cow/calf ranching operation in Wickieup, Arizona. Traegen’s family first started ranching in Oregon in the 1800’s and many family members have continued the tradition over the past three centuries. Traegen’s grandparents settled in Springerville, Arizona in the early 1950’s and have been ranching in Apache, Navajo and Catron Counties ever since. Marilyn’s grandparents settled in the small farming community of Buckeye, Arizona in the 1940’s and had a family farm producing crops and food for a family of thirteen. In May 2004 Traegen and Marilyn moved to the Milky Ranch and started a ranching partnership with Robert and Christi Worsley. The Worsley’s own the Milky Ranch and have a background primarily in business although both were raised on small family farms in rural Idaho growing up milking “Betsy” and raising chickens, sheep cattle, pigs and rabbits for meat and growing extensive gardens and caring for family fruit orchards. We are currently combining old and new practices in the livestock business to create a responsible, profitable, environmentally friendly and sustainable business while trying to preserve the family farm and ranching way of life. Our Angus/Hereford cross herd grazes native grasses and browse, including blue grama, black grama, sacaton, needle and thread, rice grass, gaeta, chamisa and white sage, on over 90 square miles of open range. Minimal protein, vitamin and mineral supplements are provided during deficient times of the year in order to maintain heard health. Efforts are currently being made to improve the ecological condition on the land by implementing rotational grazing techniques similar to the bison grazing patterns prior to the twentieth century. Extensive water development and distribution is necessary for this type of grazing. These practices will benefit the native grasses and forage on the ranch in turn providing a healthier and more plentiful diet for livestock, which allows us to produce a better quality product while developing the ecological diversity of the range. The Milky Ranch is also home to numerous herds of pronghorn antelope which are thriving due to the range and water management practices. Other wildlife includes: mule deer, quail, dove, hawks, road-runners, squirrels, chipmunks, coyotes and rabbits. The Milky Ranch, named for a tributary of the Little Colorado River (Milky Wash), has historically been leased to third parties for traditional cattle grazing and was never an owner/operated ranch until 2004. Patents to the initial fee lands which were to form the Milky Ranch were granted by the General Land Office in 1908 to the New Mexico and Arizona Land Company. The lands included the modern day Milky Ranch and also a checkerboard of sections across what is now the Petrified Forest National Park. An exchange with the Federal Government facilitated the creation of the current park early in the 1900's. The Worsley’s have been cooperating with the Petrified Forest National Park since 2004 to assist in a boundary expansion project, the National Park wishes to acquire approximately 12 additional sections of the ranch. The ranch contains numerous cultural artifacts, petrified wood, prehistoric remnants and fossils. Unfortunately, because of the mineral richness, the Milky Ranch has been subject to numerous thefts and desecrations during the previous century. The Knights and Worsleys have worked diligently to preserve and protect the resources of the land. All vandalism, theft and looting has stopped due to the personal and constant presence on the ranch.